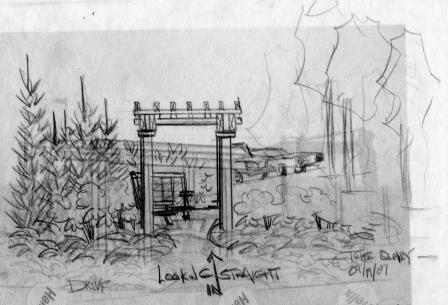 A quick pencil study of a pergola this view is looking into the end. The goal here was to find something that was aesthetically pleasing and at the same time hold the space. The space is 50×300 but we are looking at end of parking lot that is the closest to the main building. Originally there was some thought that this would be part of the cut-through. You know how us humans are. We like are shortcuts. An aside: for pencil work I like to use a Sanford pencil called Design Ebony, the lead is soft, smooth, and very dark with pressure. This pencil can be very expressive. If you are a newer reader to the Blog I will also note that the images I work from have been printed out in black&white . . . I am interested in tonal values, light/dark, and positive/negative rather than the existing colors in the “before” landscape. It’s a quirk of mine and it’s become the way I prefer to work with images.